A few days ago I curated the following essay by Charles Simic on Buster Keaton over at the Daily Beast. Check it out, won’t you? Comedy is about timing, faultless timing. It’s not so much what the story is about, but the way it is told, with its twists and surprises, that makes it humorous. Keaton draws a hook with chalk on the wall and hangs his coat on it. A brat in the theater drops his half-sucked lollipop from the balcony on an elegant lady in a box who picks it up and uses it as a lorgnette. The hangman uses a blindfold intended for the victim to polish the medal on his jacket. The shorts, especially, are full of such wild inventions. No other silent-film comic star was as ingenious. Among hundreds of examples from Keaton’s films, one of my favorites comes from the short Cops. At the annual New York City policemen’s parade, Buster and his horse and wagon find themselves in the midst of the marching cops. Buster wants to light a cigarette, and is searching his pockets for matches, when a bomb thrown by an anarchist from a rooftop lands next to him on the seat with its short fuse already sizzling. There’s a pause, “an inspiring pause,” as Twain says, building itself to a deep hush. When it has reached its proper duration, Buster picks up the bomb absentmindedly, lights his cigarette with it as if this were the most normal thing to do, and throws it back over his head. The short Cops is paradigmatic Keaton. Again, the plot is simplicity itself. In the opening scene we see Buster behind bars. The bars turn out to belong to the garden gate of the house of a girl he is in love with. “I won’t marry you till you become a businessman,” she tells him. Off he goes, through a series of adventures, first with a fat police detective in a rush to grab a taxi, the contents of whose wallet end up in Buster’s hands. Next, he is conned by a stranger who sells him a load of furniture on the sidewalk, pretending he is a starving man being evicted. The actual owner of the furniture and his family are simply moving to another location. When Buster starts to load the goods into the wagon he has just bought, the owner mistakes him for the moving man they’ve been expecting. His trip across town through the busy traffic culminates when he finds himself at the head of the police parade passing the flag-draped reviewing stand where the chief of police, the mayor, and the young woman he met at the garden gate are watching in astonishment. Still, the crowd is cheering, and he thinks it’s for him. After he tosses the anarchist’s bomb and it explodes, all hell breaks loose. “Get some cops to protect our policemen,” the mayor orders the chief of police. People run for cover, the streets empty, the entire police force takes after the diminutive hero. What an irony! Starting with love and his desire to better himself and impress the girl he adores, all he gets in return is endless trouble. It’s the comic asymmetry between his extravagant hope and the outcome that makes the plot here. The early part of the movie, with its quick shuffle of gags, gives the misleading impression of a series of small triumphs over unfavorable circumstances. Just when Buster thinks he has his bad luck finally conquered, disaster strikes again. The full force of law and order, as it were, descends on his head. Innocent as he is, he is being pursued by hundreds of policemen. Whatever he attempts to do, all his stunts and clever evasions, come to nothing because he cannot outrun his destiny. After a long chase, he ends up, unwittingly, at the very door of a police precinct. The cops are converging on him from all sides like angry hornets, blurring the entrance in their frenzy to lay their nightsticks on him, but incredibly Buster crawls between the legs of the last cop, he himself now dressed in a policeman’s uniform. Suddenly alone on the street, he pulls a key out of his pocket, locks the precinct’s door from the outside, and throws the key into a nearby trashcan. At that moment, the girl he is smitten with struts by. He looks soulfully at her, but she lifts her nose even higher and walks on. Buster hesitates for a moment, then goes to the trashcan and retrieves the key. “No guise can protect him now that his heart has been trampled on,” Gabriella Oldham says in her magnificent study of Keaton’s shorts. At the end of the film, we see him unlocking the door and being pulled by hundreds of policemen’s hands into the darkness of the building. What makes Keaton unforgettable is the composure and dignity he maintains in the face of what amounts to a deluge of misfortune in this and his other films. It’s more than anyone can bear, we think. Still, since it’s the American Dream Buster is pursuing, we anticipate a happy ending, or at least the hero having the last laugh. That’s rarely the case. 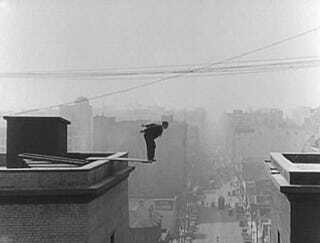 Keaton’s films, despite their laughs, have a melancholy air. When a lone tombstone with Buster’s porkpie hat resting on it accompanies the end in Cops, we are disconcerted. The images of him running down the wide, empty avenue, of his feeble attempt to disguise himself by holding his clip-on tie under his nose to simulate a mustache and goatee, are equally poignant. Let’s see if we can make our fate laugh, is his hope. Comedy at such a high level says more about the predicament of the ordinary individual in the world than tragedy does. If you seek true seriousness and you suspect that it is inseparable from laughter, then Buster Keaton ought to be your favorite philosopher.